Adeste Fideles is one of the most beloved holiday songs of all time. It has been performed more than possibly any other song in history, but none more uplifting or more exciting than the live version by The Three Tenors. Luciano Pavarotti, gone but certainly not forgotten, Jose Carreras, and Placido Domingo were an unbeatable team. Solo, they each enjoyed glittering careers in the opera that so gladly welcomed them, but together they were celebrated in high style. Their combined voices are glorious to behold. The soul soars when it can fly on wings as gossamer as these. 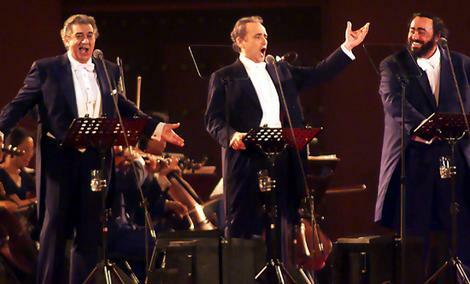 In this live performance, The Three Tenors thrilled their audience to a near frenzy with Adeste Fideles. Thanks to the miracle of the internet it is here to be enjoyed for eternity.